Tasting Notes: Refreshing, fragrant, subtle, natural sweetness. Ingredients: Apple pieces, orange slices, hibiscus blossoms, blackberry leaves, apple cubes, stinging nettle leaves pineapple flakes, papaya flakes, silver linden blossoms, freeze-dried strawberry pieces, freeze-dried whole raspberries sunflower blossoms, rose petals, Roman chamomile. Herbal midsummer celebration! This Pineapple Cherry Bloom blend has bright and fresh fruit flavour with lovely blooming floral, in keeping with traditional Swedish midsummer blossoms! This cheery summery brew is bursting with fresh pineapple and ripe cherry sweetness! The blend features whole raspberries, generous slices of freeze-dried strawberry, and large pieces of apple, pineapple and papaya! Our herbal base of blackberry leaves, rose petals, linden, and stinging nettle is abounding in healthy properties. Stinging nettle is a cure-all herb, known to help manage diabetes, is also used for joint ailments, as a diuretic, and helps with urinary tract issues. 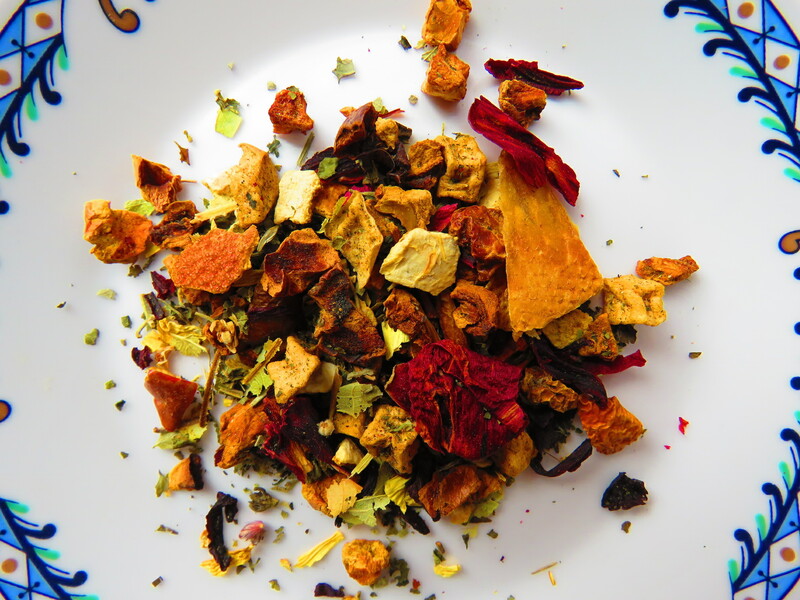 Treat yourself to the taste of summer, long sunshine filled days, gorgeous flowers in full bloom, and fresh summertime fruit flavour with this superb herbal blend!